Attention Bucket Listers, Racing enthusiasts, and Race Fans! Make your fantasies a REALITY with this EXCLUSIVE Richard Petty Fantasy Experience. This once in a lifetime experience is truly a unique experience exclusively offered with NASCAR Racing Experience at Charlotte Motor Speedway. Meet The King himself, Tour the #43 Car Race Shop and enjoy a catered lunch. PLUS drive a NASCAR race car by yourself for 30 laps around Charlotte Motor Speedway! And that's not it! Package includes 2 nights hotel, bus transportation, NASCAR Ride Along, Go Karting, Souvenirs, Video, Food, and MORE! May 29, 2019- Welcome! 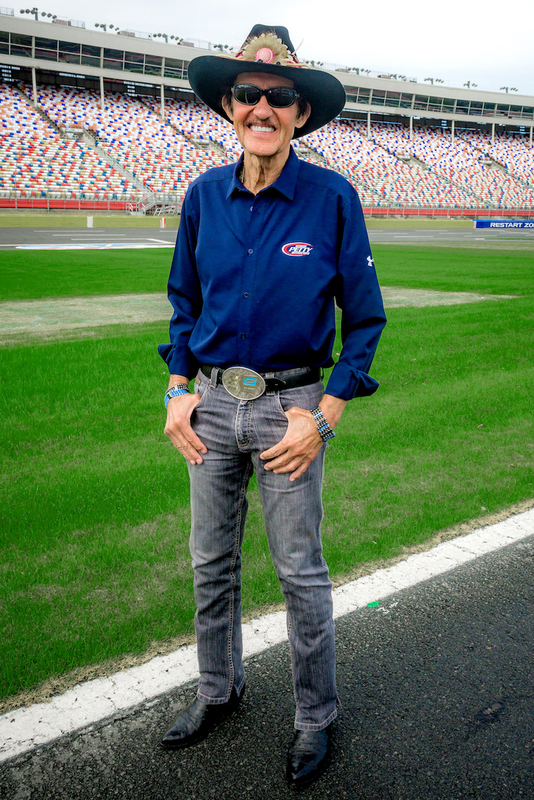 The Richard Petty Fantasy Experience begins on May 29, 2019 as you Check-in at the Welcome Reception, at The Speedpark, Concord Mills in Concord, NC. Enjoy unlimited go karting and light food during the reception and pick up your goody bag including a NASCAR Racing Experience logo hat and t-shirt. Then head to the Embassy Suites to get plenty of rest and relaxation before the big day. May 30, 2019 - Your Fantasy Day Experience is about to go full speed! Enjoy breakfast at the Embassy Suites before getting on the bus for a trip to Richard Petty's 43 Car Race Shop. Get a behind the scenes tour of this amazing race shop and see where all the action takes place before the race cars hit the track. Following the shop tour, you'll meet the King himself, Richard Petty. Take photos and get autographs with Richard Petty in this intimate Meet and Greet. Then enjoy a delicious catered lunch at the 43 Car Race Shop. Head to Charlotte Motor Speedway! Following lunch, get back on the bus and head to Charlotte Motor Speedway. While on the bus you’ll go thru the Driver’s Meeting including training and instruction with a Crew Chief before you get to the speedway. Once you arrive at Charlotte Motor Speedway, you’ll get suited up and ready to race! Drivers Start Your Engines! Get behind the wheel and drive (3) 10 lap-racing sessions by yourself on the Charlotte Motor Speedway. There’s no lead car to follow and no instructor riding with you as you drive your laps at NASCAR Racing Experience. Get the adrenaline pumping and work on driving faster speeds as your Personal Spotter coaches you each and every lap over two-way, in car radio communications. Pull into the pits between each racing session for a quick pit stop and then head back out on the track for your final rounds of racing. Give it all you got in this once in a lifetime driving experience! Did you bring a guest? If so, they’re in luck. Not only do they get to root for their favorite driver but also they get to take a 3-lap NASCAR ride along in a real NASCAR race car as a passenger. Closing Ceremony- We saved the best for the last. Drivers attend the Closing Ceremony where top speeds will be announced. Although only driver will have the fastest speed, everyone will receive a commemorative, custom ring for bragging rights along with a Graduate Certificate, Souvenier Racing License, Deluxe Photo Plaque, and In Car Video. Hotel Check-in: After 3pm, check in at the Embassy Suites located just minutes from Charlotte Motor Speedway and The Speedpark Concord Mills. 6pm-9pm: Welcome Reception-Check in and attend the Welcome Reception at The Speedpark, Concord Mills. Enjoy unlimited Go Karting, finger food and beverages. Plus pick up goody bag including your logo hat and t-shirt. 8am- Bus picks you up bright and early at Embassy Suites to start the day’s events. Meet and Greet with Richard Petty. 1pm- Load up on the Bus. Attend Driver’s Meeting for training and instruction while on the bus ride to Charlotte Motor Speedway. 2pm- Get suited up in racing gear and prepare to drive! 2:30pm- On track driving experience. Drive (3) 10 lap sessions all back to back. A total of 30 laps of driving. Either you or your guest take a 3 lap, NASCAR Ride Along. 5pm: Closing Ceremony- Find out how fast you went and see who took first place with the top speed. Receive Graduate Certificate with top speed, Deluxe photo plaque, In Car Video and get sized for your Commemorative Custom Ring. 6pm- Take the Bus back to the Embassy Suites Hotel. Richard Petty Fantasy Experience is May 29, 2019 and May 30, 2019. Hotel Accommodations are at the Embassy Suites by Hilton Charlotte Concord Golf Resort & Spa. Two nights in a standard room based on double occupancy is included. A credit card will be required for hotel incidentals. The Speedpark at Concord Mills in Concord, NC will be hosting the Welcome Reception. Unlimited Go Karting, food and drinks will be provided for you and a guest. Round trip bus transportation is included from the hotel to the race shop, from the race shop to the Charlotte Motor Speedway and from the speedway to the Embassy Suites. Bus transportation is provided for you and one guest. The Race Shop Tour, Meet and Greet, Lunch and drinks will be provided for you and one guest. The driving experience will be at the Charlotte Motor Speedway. The 30 lap driving experience will be for one driver. The 30 lap driving experience is divided into (3) 10 lap driving sessions. There will be no lead car to follow and no instructor riding with you. This exclusive driving experience will only be offered on Fantasy Day. A NASCAR Ride Along will be provided for a guest. Drivers must have a valid drivers license to drive. If under 18 years old, parental consent will be required. Drivers will be sized for commemorative custom ring during the Closing Ceremony. Rings will be ordered and shipped directly to the driver. All other souvenirs will be available to take home upon completion of the Fantasy Experience. Limited space is available. Richard Petty Fantasy Experience is an exclusive experience offered to a small group of participants. Credit Card payment in full is required for reservations. There are no refunds for any reason. All addresses and detailed instructions will be provided once reservations are made. Questions? Call customer service at 704-886-2400.